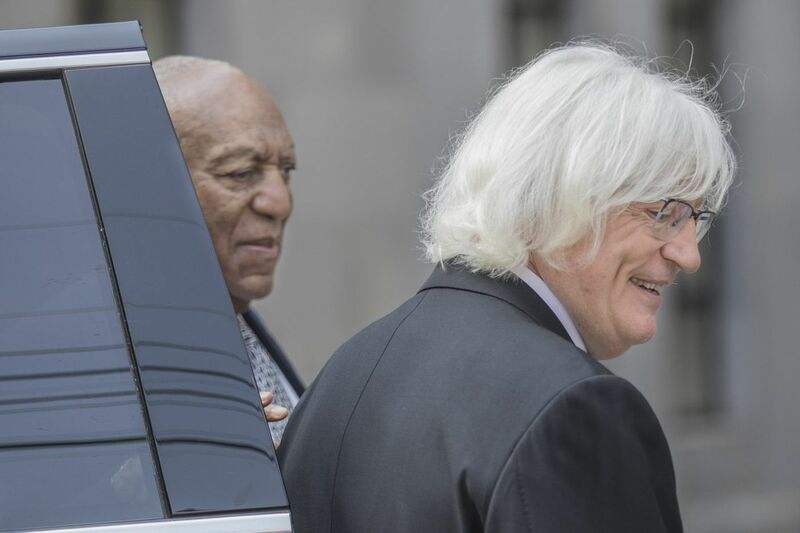 Bill Cosby and his new attorney Tom Mesereau after a pre-trial hearing at the Montgomery County Courthouse in Norristown, PA on Tuesday, August 22, 2017. Mesereau represented Michael Jackson in 2005 against child molestation charges. Bill Cosby has hired the lawyer who successfully defended Michael Jackson in 2005 against child molestation charges to represent him at a Nov. 6 retrial in his sexual assault case. The 80-year-old entertainer said Monday that Tom Mesereau of Los Angeles would lead a team that also includes Sam Silver, a Philadelphia-based lawyer who defended former U.S. Rep. Chaka Fattah and ex-Pennsylvania State University president Graham B. Spanier in separate criminal cases. Cosby wrote in a tweet that he was "pleased to announce" his new team. The unveiling came a day before the first court hearing in the case since June, when the jury that heard Cosby's first trial failed to reach a verdict after more than 50 hours of deliberations. The defense lawyers who shepherded Cosby through that first two-week proceeding — Brian J. McMonagle of Philadelphia and Angela Agrusa of Los Angeles – have asked Montgomery County Judge Steven T. O'Neill to let them bow out of the case. Actor/Comedian Bill Cosby is pleased to announce his new legal team for his criminal retrial. Meserau, an outspoken, TV-friendly advocate with a distinctive shock of chin-length white hair, had expressed interest in representing Cosby as far back as 2015, according to sources familiar with their discussions. He was unavailable for comment Monday, and a spokesman for Cosby did not respond to questions about how the new legal team's approach might differ from that of Cosby's initial defense. As recently as last month, Mesereau described the retrial in the case involving 12-year-old allegations from accuser Andrea Constand as a waste of time. "I think it's a weak case, and they should have known that," Mesereau told TMZ before he had been hired by Cosby. "I don't think they should retry it. They should let him live his life and drop the whole thing." Mesereau's past celebrity clients include boxer Mike Tyson, actor Robert Blake, and music producer Marion "Suge" Knight. But his best-known courtroom victory – in the Jackson child molestation trial – bears a striking resemblance to the Cosby case, one Mesereau has himself frequently noted in cable TV news appearances over the past two years. "Mr. Cosby reminds me of Michael Jackson," he told CNN on Dec. 30, 2015, the day of Cosby's arrest. "As soon as [Jackson] was charged, every major network was doing a special on him, all of them negative. [All of his accusers] had settled cases for money, [and everyone thought] he couldn't possibly prevail in any criminal courtroom." The battles surrounding both men's reputations have played out as much in tabloids and mainstream news outlets as they did in the courtroom. Like Cosby, Jackson had been beset by allegations from several accusers, though only two eventually testified at trial. "There were dozens of so-called witnesses saying [Jackson] was a molester," Mesereau said while discussing the Cosby case with CNN in July 2015. "After about the seventh one got crucified in cross-examination, this very conservative jury was wondering what clown is the other side going to put up next." Silver, one of the other new defense lawyers Cosby named Monday, is a partner at Center City's Schnader law firm and has been part of Cosby's broader legal team for more than a year, primarily focused on civil cases involving allegations from the entertainer's other accusers. The third member of the team, Kathleen Bliss, has managed her own boutique law firm in a suburb of Las Vegas since 2015. Cosby has denied charges that he drugged and sexually assaulted Constand, a former operations manager for Temple University's women's basketball team, as she visited his Cheltenham home in 2004. The case is the only criminal prosecution against Cosby to emerge from the allegations of more than 50 other women who have publicly accused the entertainer of similar conduct in incidents dating back decades.